Orphaned during the Savannah Flu, Javier is looking for other spellcasters without knowing if any survived. When he finds a caster named Morgan and her nieces, Igraine and Iliesa, he has to hide the secret of his isolated upbringing, desperate not to alienate the only community he has left. But Igraine and Iliesa have secrets of their own. The wild hunt comes to the mortal world seeking them. Why the Queen of Faerie wants them, no one knows, but no one wants to hang around to find out. 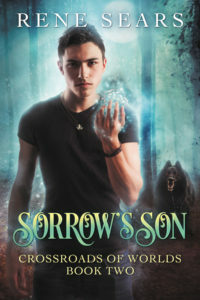 Javier flees with them between worlds, finding a rare talent for communicating with fae creatures—though he’s sure his father wouldn’t have approved of his new hellhound. A mysterious man claiming to be from his mother’s estranged family finds Javier, but does he want to claim the family his mother repudiated? He must choose whether to go to his mother’s family or help his new friends—but it may be too late to escape the malevolent gaze of the Queen of Faerie. Sorrow’s Son is available for purchase. The Goodreads page is here. The queen of Faerie sat on her throne in the Shining Courts and surveyed the gathered peerage of her realm. I have faced worse than this, she told herself, worse than this, and won. The Flower War, the terrible decades after the king had vanished, the more personal tragedies when she had miscarried the three children she had hoped to have with her husband. But for all that she reminded herself of the challenges she’d won through, she was afraid in a way she’d never been before. Not all at once. Not immediately. But Faerie’s magic was unbalanced. When she shut the gates to overhill against a threat from a human magician that might have killed innumerable of her people, the magic had snapped back on itself, bereft of its flow through the gates. She’d reacted as she had to, to save Faerie, but she wished she’d found another way. The magician at least was dead, and would trouble her people no more. The land was failing. Magic twisted and wrong in some places, draining away entirely in others. She could feel it in her body, phantom pains in her limbs, an ache in her guts that nothing could ease. If Oberon was still alive, wherever he was, did he feel it too? Music floated up to her, the musicians hidden by glamours that changed according to her whim. Right now, the hall looked like the oldest parts of the deep woods, as they had looked before the wrongness came to her land. The people were different, though. They clustered in small groups, talking in low, worried voices. They expected her to fix this, to heal what had grown twisted. She expected it of herself. Not all of her people, quite. One stood alone: her scapegrace jackdaw, her changeling son. Lord Rowan. He leaned against a column glamoured to look like a tree, his hair falling tangled around his shoulders, face nearly unreadable as her own. Most often she thought he more strongly favored her, but right now she could see the lines of his human father’s face, long since gone to dust overhill. Her nobles left a space around him. Perhaps that was why he had stayed so long overhill himself. Perhaps anonymity there was preferable to notoriety here. She had not handled him as well as she might, she could admit that to herself. She would have to deal with him eventually, but for now, let him keep apart if he wished it. He was here; it was closer than he had been in decades. The tap of a staff on marble echoed from the admitting hallway. The musicians ceased playing as Crane, her majordomo, turned to announce a newcomer. Gloriana sat up straighter when she saw who it was. Finally. Lady Briar’s cloak and riding habit let off puffs of dust as she strode across the hall. Gloriana approved. She had told her to return with all haste, and stopping to change would have been respecting formalities over her duty. Nobles moved to the side as Briar swept by. Rowan watched impassively. No love lost there; hardly a surprise given their history. Briar sank to her knees before the throne, skirts pooling gracefully on the marble floor. “Your majesty.” She bowed her head and waited. “You may speak,” Gloriana said. The hall fell silent except for the rustle of fabric as her courtiers shifted. The words pierced Gloriana. Not a sound stirred the hall. Her people waited to see what she would do. She gripped the arms of her throne so hard her fingers ached. Well. She knew her duty. If she lost all else, she would still have that. “I am ready,” she said. A sigh swept through her gathered people. Grief? Perhaps. Perhaps not. She felt as though her bones were filled with iron, burning and ice-cold at the same time. Blood rushed back into Gloriana’s hands, and lips, and heart. The land could yet be saved, and she did not have to die. But the relief was mixed with dread. Every ruler must be prepared to give herself for her land, for her people, but who else would stand ready to make such a sacrifice? What if the land required someone who refused to give themselves to it? What if it needed one of her lieges, whom she had sworn to protect? What if it needed one of the Old Powers of the deep woods? A human? “Tell us, then,” she said to Briar. Briar ran a finger along the spiral of the shell. The Oracle’s voice came out, low and musical. The words were anything but comforting, though. And yet it may bloom ere midwinter. The elder Lady Elm came forward, her mouth a stern line. Elm was an old house, perhaps not the most entwined with court life, but it would be a mistake to think they didn’t have their fingers in any number of pies. This would need to be approached with delicacy. Go willing, the Oracle had said; that might mean that the house must give willingly, not only the individual to be sacrificed. Their mother? Ah. Yes, of course. “The human. The former ambassador from the New York group,” Gloriana said carefully. Lady Elm knew about her little project, of course, since the human was technically part of her house, but not all of her courtiers did. “The same. The children are changelings, and last I saw them, they might have been ten.” A murmur went through the court. Any fae might dally with a mortal, and children might result—her own son Rowan was proof enough of that—but one didn’t marry them and take the offspring into one’s house. Except that Eiddon, Lord Elm, had. Interesting. How useful that he was already in her custody. The matter of the children aging was interesting as well. Was the land making them ready for the sacrifice it needed? Gloriana knew as much as anyone could about the old magic of Faerie, but even she couldn’t answer that. And it might well be easier for her courtiers to accept the sacrifice of a changeling than one of their own. “You will bring them to me,” she told Lady Elm. “They are not. I have not…” Elm trailed off. Gloriana could finish that sentence a number of ways. Kept up with them. Bothered to find out where they are. Made them entirely a part of my family. After all, they had not been important, until now. As she descended the dais, she looked for her own changeling son. This was the kind of task she would once have given to him. He was no longer at the column, or anywhere in the room that she could see. Perhaps the Oracle’s foreseeing had disturbed him. In truth, it disturbed her as well. But no matter. She would do whatever she had to do. Sacrifice herself, commit unforgiveable crimes, turn her hands an even darker red. The package hung out of the mailbox, the international label clearly visible. I sighed. The mail man was very nice, but he refused to consider that the contents of a package might be delicate. To be fair, no matter whether your package was mailed from Vancouver or Heflin, Alabama, you were equally unlikely to obtain a “magical item enclosed” label. Professor Emily Leung had done her best by marking the padded envelope “contents fragile—please hand cancel.” I extracted the envelope carefully along with a few bills mashed behind it. Maybe, just maybe, I’d be able to get my nieces to help me decipher whatever it was Emily had sent me. Her email had just said it was jewelry and promised more details with the piece itself. She saved anything she suspected of being possibly dangerous for the rare occasions we were able to meet in person rather than trust it to the mail, so maybe the girls could help. They needed a distraction. Well, no, that wasn’t completely true. I wanted them to have a distraction. What they could really use was a friend, someone who wasn’t me, someone they could blow off steam with. I couldn’t provide them with that, not yet. I’d never really made myself a part of my little community. I worked from home, and I recently become aware of how I’d kept myself apart from most of the people around me. That might have been okay for me, but it wasn’t enough for the girls. They were restless, and I couldn’t blame them. School didn’t start for another six weeks, and they didn’t have enough to do. I flipped through the mail. My fingers snagged on the one envelope that wasn’t a bill or junk—an envelope marked with the school logo. Finally. The final set of forms for me and them to sign. I walked into the house and tossed my keys on the counter. Igraine was reading in one of the kitchen chairs, her bare feet propped on the table, a bowl of grapes at her side. She looked up and took in the package in my hands. “I don’t know yet. Something from my Canadian friend.” I flourished the other envelope. “But I have school forms.” Despite my best efforts to make that sound enticing, Igraine frowned. I didn’t blame her; I knew this wasn’t really where she wanted to be. I set the envelope on the kitchen counter and let her get back to her book. I took the package into my office and sliced open the envelope without really paying attention. Igraine and Iliesa needed friends their own age. Without that, they’d never feel at home here, never want to stay. Magic couldn’t solve this problem; nothing would but time. I leaned back and touched the silver figurines my father had given me the Christmas I was ten. My sister Guinevere had two just like them. He’d been an Arthurian scholar—hence mine and my sister’s names—and the statuettes were supposed to be Morgan le Fay and Guinevere. They weren’t magical, weren’t energy wells or wards or anything else, but Gwen and I had made a habit of opening ourselves to the leylines and wishing whenever we wanted something as kids. I hadn’t done it in years, but I did now. It wasn’t a spell, just a wish. I wish the girls would be happy here. Help me find them a friend, I thought. And while I was at it, Help me find Gwen and bring her back to her girls. I don’t think I’m doing this right. And then, the silver warm beneath my fingers, Please, please bring Rowan back to me. Then I let the figurines go and closed myself off from the ley energy. I wouldn’t even think of Rowan by his true name, Conant, while I was touching the ley, for fear of accidentally somehow compelling him, but he’d been gone for so long. I hoped he was all right. I hoped he still wanted to come back to me. Then, because I still had work to do on things I could control, I turned back to the envelope and told myself to pay attention. But at the back of my mind, I hoped my wishes could come true. I’d been running from the monster for three days now, and I wasn’t even out of Atlanta. Towering metal-and-concrete canyons had given way to a sprawling expanse of strip malls and highways. This particular strip mall housed a glass-fronted shop with a faded display of black cloth and cards bracketed by iron bars between a vape shop and a payday advance place. A tattered sign above the cards read THE MAGIC SHOPPE in a curly font. I had no real hope there would be any actual casters here, but…I don’t know why I stopped, except I was desperate for someone to see me and know what I was. I surreptitiously touched the lump of incense in my pocket. I had yet to get a hit off the spell I’d cast at least once a day since I left my aunt’s apartment, but this place might—might—hold a clue. If I could find someone else like me, maybe they could explain why the monster had come after me. Bells jangled as I pushed through the door. It was musty inside, dark and close, and when I called my spellsight, nothing glowed silver. Except…I went deeper into the shop, following the faintest smudge of light. I followed it to a metal chest in the back of the shop. I tipped back the lid. The silver light inside was pale and gray, but brighter than what I’d been following, just barely. I touched the tiny silver frog on a cord around my neck for luck and reached into the chest. The glow led to a blunt silver dagger set with glass “jewels”—more a letter opener than an actual knife—but it was pretty, and at one point it’d been imbued with magic. Either it was used in a ritual or it was spelled to do something. I couldn’t tell what. The traces of magic were faint with age. Disappointment hit me—whatever magic had touched this blade, it had happened long before the Savannah flu and its death toll for magic users. I turned. The man behind the counter was paunchy and a graying ponytail hung down his back. I didn’t sense any wards or charms on him. He squinted at me through wire-frame bifocals. “What was the guy asking about?” I asked instead. “I’ll give you ten.” It couldn’t be actual silver, not for twenty bucks. “Fifteen.” I considered the steadily-dwindling stack of cash my aunt had given me before she left. I really shouldn’t spend any of it on something like this—I had no way of knowing when she’d be back. Still, the knife drew me—even old and unused, it was the first link I’d seen to other casters. “I’ll take it.” I crossed the store to the counter, fishing three crumpled fives out of my wallet. This close, the guy smelled like patchouli and smoke. There was a display of bongs labeled water pipes next to the register. The guy wrote a note in an actual ledger—no bar code items here—and popped a button on an antique cash register to put away the money. “If that guy comes back, what should I tell him?” He raised faded blue eyes to meet mine. “If you say so.” He wrapped the knife in newspaper—for fifteen bucks I wasn’t getting the chest—and dropped it in a plastic bag with THANK YOU printed on it in red letters. “Safe travels,” he said after I thanked him, and retreated though a clacking beaded curtain to the back of the shop. The parking lot had been mostly empty when I walked up, but now there was a conspicuous addition next to the old Cadillacs and rusted Hondas: a gleaming black SUV with rental plates. I didn’t know a ton about cars, but I’d been learning since I came to the mainland, and this one was obviously expensive. I pulled my baseball hat down low over my eyes and cut away from the SUV, toward the road that led back to the highway. “Hey! Hey!” a voice called from the SUV. I tucked my chin and walked faster, pulse speeding. There was no reason for anyone to be looking for me. My aunt was the only person who knew who I was, and she had flown to Puerto Rico to be with her pregnant daughter. Feet pounded on asphalt as he ran to catch up with me. I whirled around as he reached for my arm. He was older than me, but not much, and he looked strangely familiar—but I knew I’d never met him before. The circle of my acquaintances just wasn’t that big. His eyes widened as he took me in, and his hand twisted up and to the side. I didn’t need spellsight to recognize it as the trigger gesture to a spell. Which one? I wasn’t going to wait to find out. Most spells took time to set up, but there were ways around that. My mother had made me dozens of little charms over the years, ways to track me, protect me as I ran wild through the woods. The frog at my neck had been one of them, a chirping coquí from the home my mother had renounced and I’d never been to. It fell silent when she died—all her spells did. I hadn’t been able to fool myself that she was still living for very long. I’d made my own charms, braided threads wrapped around beads set with spells. I was guessing he had something similar on him somewhere. When he started to cast, I grabbed the collection of cords around my wrist. My father and I had had worked out a simple spell of misdirection. The strands of the spell snapped into a complex web that would take him precious seconds to unpick—and while he was doing that he wouldn’t be able to see me or get a fix on a spell. His face contorted; confusion or frustration, I wasn’t sticking around to find out. I took off running, ducking behind the row of shops, ignoring the rotten stink of the dumpsters as I sucked in breath. I jumped over a concrete retaining wall into the woods behind the shops, shoving through a tree break for perhaps twenty feet until it opened onto a residential street. I stopped for a moment, heart hummingbird-fast and hands trembling with adrenaline. A scratch on my face from a branch I hadn’t noticed burned. I tightened the straps of my backpack and set off at a fast walk. As much as I wanted to book it, a dirty kid running through a neighborhood was going to attract the wrong kind of attention. I went right at the next intersection, then right again, then left. A mom and two kids were throwing a ball in front of a yellow house. The mom frowned at me; I waved a hello and kept walking. Who the hell was that guy? What did he want from me? Maybe he’d been friendly, and maybe I shouldn’t have run—I was looking for other casters—but then why had he opened with a spell? It was hard to interpret that as anything other than aggressive. Maybe he was like me, just looking for another caster…any caster. I shook my head, despair a flat flavor over my tongue. I’d finally found a caster—or he’d found me—and I’d had to run away. But I’d known I’d have to be careful. My father had warned me that there were groups of casters—”My enemies,” he’d said, with a sour twist to his lips—who hated him. My pulse slowed as I walked and there was no screech of wheels behind me. I’d cut straight into this neighborhood, but if he didn’t want to abandon his slick car, he’d have to drive around and around to get from the strip mall to here, and the confusion spell should have kept him distracted long enough that he wouldn’t be sure exactly which way I’d gone. I followed the residential street a few more blocks. When I came to a secluded stand of trees at a crossroad, I pulled a lump of incense out of my backpack. I’d been using my little coquí to store power since Mamá died, and I pulled a thread of power from it rather than look for a leyline here. I broke off a chunk of incense the size of the tip of my thumb and cupped it in my hands. I thought of fire, of the spark that jumped when I thumbed the wheel of a lighter. I hadn’t needed a lighter in years. The incense began to smolder dully, sweet smoke dribbling out between my fingers. It burned against my skin, but the pain was only a minor distraction. This was the slow way to cast, not nearly as efficient as what my father taught me, but not nearly as distinctive either, and if the guy—or the monster from my aunt’s apartment—were following me, this tiny blip of magical energy shouldn’t register. I had a thousand memories of my parents showing me how to cast. I swallowed as a sudden pang of loss surged out of the ever-present ache of grief. I couldn’t let it interfere with the spell. My father wouldn’t have wanted that, no matter how basic the casting. I waited until the smoke was thicker, then focused my need and pulled a trickle of magic from the air. I need to find someone like me. Someone who will help me. A lump of sadness or panic threatened to choke me, but I swallowed it down. They can’t all be dead but me and that guy. I need other casters. Show me where they live. The smoke wavered, sweet and thick-smelling, then spilled out in a line, ahead and to the west, as if a strong but very pinpointed wind blew it flat. It was a thin line, and not as decisive as I would have liked, but for the first time since I left my aunt’s place, it was there. Relief weakened my knees and I stumbled even though I was standing still. I wasn’t alone. The Savannah flu hadn’t killed them all. There are others like me, out there somewhere. I pinched out the incense. The smoke dissipated until all that was left was the memory of the smell. Now I just had to keep walking. One step after another. I headed west.